Aggression in dogs is quite common, and is a big concern for anyone who has a dog with aggressive tendencies. Aggression in dogs is defined as the threat of harm to another individual. Be it dog or human. It can involve snarling, growling, snapping, biting, barking or lunging. Yes, most dogs show some of these behaviors occasionally. Usually as a warning to another dog, or human that is invading their space, or frightening them. But if it’s a common behavior in certain circumstances, then it becomes a problem. Just like with our little Monkey. By working with your dog, you can calm much of the aggressive behavior. But before you start to work with your dog to calm his aggression, you need to know what’s causing it. There are many reasons for aggression in dogs. Fear motivated aggression in dogs is the most common. When a dog fears for their own safety they are much more likely to display aggressive behavior. Even if the threat to the dog is only imagined by the dog. Keep in mind that, it’s his perspective when he feels threatened. Even just a human leaning over a fearful dog may cause this fear. Or another dog approaching. It’s all how the dog perceives things. Resource guarding aggression in dogs is another common type of aggression. Aggression in dogs can happen when they attempt to protect their resources, be it food, toys, beds or even their humans. It can become a problem if they resort to snapping or biting, instead of just warning growls. This happens a lot when it comes to feeding multiple dogs in the same space. Our Jackyl is a prime example of this. So we feed him at the same time, but gated into his own space, where none of the other dogs can threaten his bowl. Territorial aggression happens when a dog is guarding “their” space. A lot of dogs do this, but they aren’t really aggressive dogs. Only when it’s taken to the extreme does this type of aggression become a problem. Our Chewy Lewis is a big barker when someone new approaches the house, if he’s outside. But as soon as one of his humans steps outside, he runs and hides behind us. Protective aggression in dogs is mainly a mother dog protecting her young. Or in my household, Santana and Pantera protecting Monkey. She might as well be their child, they are so protective of her, from both people and other animals. Dogs have a prey drive, some dogs worse than others. Especially breeds that were bred to be hunting dogs, such as the Jack Russell Terrier. Predatory aggression is motivated by an animals urge to hunt, and is often seen in dogs chasing smaller animals, or even small children. Dogs can get frustrated just like human do. And what do humans do when they get frustrated? They get cranky, and they sometimes act out their frustration. In dogs, cranky turns into aggression. If a dog is forced to do something he doesn’t want to do, or held back from doing something that he really wants to do, they can become frustrated and show aggression towards the nearest animal or person. Such as when you try to take something away from a dog that hasn’t master the “drop it” or “leave it” command. It can also happen in crates or kennels, which are, in effect, holding the dog back from doing something he really wants to do. It can also manifest as redirected aggression, which is our biggest problem with the little Monkey. When something gets her overexcited, such as a knock on the door, or a loud noise in the house, she can’t get to the object that provides the stimulus, so she instead redirects her frustration, and her aggression at the closest dog that she deems weaker than her. Dog are natural pack animals. As in any group situations, leaders and followers emerge. Leaders take charge, of both the situation and resources for the group. And just like with humans, if more than one leader tries to take charge, fights can break out. But with animals, the fights are going to be more than just arguments. So when a one pack member attempts to take control, any other animal who perceives himself to be the leader will attempt to regain control. Social aggression in dogs most often occurs in un-neutered males, but isn’t exclusive to them. It can happen with dominant females, spayed or un-spayed. For an un-neutered male, neutering, along with training can help to reduce the social aggression. Similar to fear aggression in dogs, pain induced aggression can cause an otherwise docile dog to exhibit aggressive tendencies, in an attempt to prevent future pain. Often this means they attack the closest person or animal, since they often can’t attack the source of the pain. This is why people often get bit while trying to help an injured animal. Training devices that cause pain can cause dogs to exhibit this type of aggression also. Prong collars, choke chains and electric shock collars are often the cause. Aggression in dogs can be due to many different medical issues. If the aggression is accompanied by the loss of hair, increased body weight and lethargy it could be a sign of hypothyroidism. And you should have your dog checked by a veterinarian. Aggression after convulsions, or when the dog appears absent or confused, or when rapid mood changes occur may be the result of seizures, full or partial. Brain damage, to certain parts of the brain from diseases such as hydrocephalus, tumors, thyroid issues or trauma can also lead to aggression in dogs. Consult with your veterinarian to see if these could be the cause of your dog’s aggression. If a dog acts aggressively for any of the previously mentioned types of aggression, but even more so for fear based aggression, they can learn that the best way to get what they want is to repeat the aggression. And lastly, some dogs, so experts say, are genetically predisposed to aggression. But it isn’t breed specific. Dogs of any breed can be selectively bred for aggression, either intentionally, or unintentionally by non-responsible breeders. 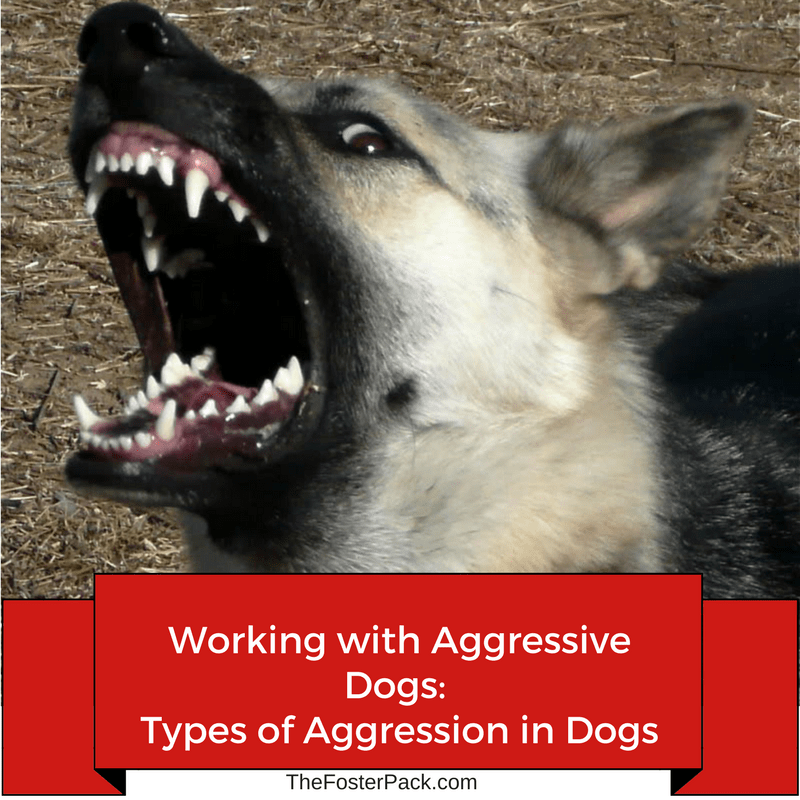 Now that you know about the different types of aggression in dogs, can you recognize the type of aggression your dog, or dogs are experiencing? Next we’ll talk about how to work with your dog, on changing the aggressive behavior.